This issue is kindly sponsored by Arthur J. Gallagher. Arthur J. Gallagher estimates that total credit insurance market exposure to some of the biggest corporate failures in 2014 is hundreds of millions of US dollars. Arthur J. Gallagher has published a report, 'Report and Market Update: Credit and Political Risk Insurance (CPRI) - January 2015', which summarises the changes in line structure and tenors available from commercial political risk insurers and comments that market capacity has more than doubled since 2008. The report also advises that despite a number of largely unpredicted high profile/high value corporate failures for which total credit insurance market exposure was significant, 2014 is estimated to be another profitable year for the main credit insurers. Looking ahead, the report predicts that capacity is expected to be plentiful at attractive premium rates. "Credit insurance continues to remain excellent value". To view Arthur J. Gallagher's report go to http://www.ajginternational.com/media/96288/cpri-market-report-january-2015.pdf. Trade credit insurance companies accused of arguing a non-disclosure defence to avoid paying claims. Global Trade has published an article, 'Maximizing coverage under Trade Credit Insurance policies', which lists some of the benefits of credit insurance but also warns: "While trade credit insurance may hold advantages for policyholders, recovering under such policies is all too often a challenge." The article cautions that insurance companies often argue non-disclosure defence to avoid paying claims and advises that, particularly in the context of transaction-specific insurance, policyholders must start thinking about this issue from the outset. "A proactive and cooperative approach will help get claims paid." To view the article on Global Trade's website go to http://www.globaltrademag.com/banking-on-global-trade/maximizing-insurance-coverage-under-trade-credit-insurance-policies?gtd=3979. An example of Credit Insurance and Collections Fraud. Octávio Aronis, an Attorney at Aronis Advogados, has published an article examining a type of credit insurance scam in which the buyer and seller collude. He explains that both parties set up legitimate companies in their respective countries and execute several transactions on a relatively small scale over a sufficient time for a payment history and a credit risk assessment to become perceived as reliable and verifiable. "Then comes the big order in which the seller will request a significantly large amount of coverage. Based upon the previous payment and credit history, significant coverage may be provided." At that point the seller will export bogus goods from a country or port where shipping procedures are not strictly adhered to and create false documentation showing that goods were shipped. Then, when 'payment' is not made, a claim is submitted. To view the article go to https://www.linkedin.com/pulse/credit-insurance-fraud-impacting-both-collections-oct%C3%A1vio-aronis?trk=prof-post. Euler Hermes advises that 2014 "ended in horror story mode", and considers if a happier ending is in sight for 2015. In its latest Economic Outlook, 'Not such a Grimm tale but no fabled happy ending', Euler Hermes advises that cautious optimism remains vital. In 2014, only Spain, the UK, Ireland and India outperformed Euler Hermes' broadly below consensus expectations, "and even then these outperformances were modest." Looking ahead, Euler Hermes predicts that in 2015 advanced economies can be expected to grow at 2.1% (the fastest pace since 2010), with 3.1% growth in the US and 1.1% growth in the eurozone (the latter experiencing its highest growth in four years). The report also advises that emerging economies will barely recover from a sub-par 3.8% performance in 2014 to expand 3.9% in 2015. To view the full report go to http://www.eulerhermes.com/mediacenter/Lists/mediacenter-documents/Economic-Outlook-overview-2015-1214-jan15.pdf. Coface launches its Easyliner product in Australia. Coface advises that EasyLiner is designed to be a turnkey policy, specifically for SMEs, which includes information on and monitoring of buyers, debt collection and rapid claims indemnification. The product was initially launched in Spain and the UK in early 2014, with plans to roll out in the 66 countries where Coface is present. Rachel Filipov, Marketing & Communications Manager at Coface in Australia, commented: “With EasyLiner, Coface’s objective is to provide protection against unpaid invoices to SMEs everywhere in the world. Coface has already launched this product in other parts of the world and we are proud to be offering it in Australia now." Coface advises that 25% of Australian companies fail due to unpaid invoices. To view Coface Australia's YouTube clip launching the product go to http://youtu.be/4E82Onhd5bI. The growing role of trade credit insurance in the Middle East. Middle East Insurance Review has published an article, 'The growing role of trade credit insurance in the Middle East', in which the ICISA's Executive Director, Robert Nijhout, examines the challenges and opportunities faced by companies in the MENA region and the credit insurance products currently available. He advises that the estimated premium for the region is around US$60 million, and the outlook is positive with demand for credit insurance on the rise. In addition claims have stabilised, while market conditions are less soft, resulting in somewhat higher premium rates and stricter underwriting in certain cases. To view the article go to http://www.meinsurancereview.com/Magazine/ReadMagazineArticle/aid/35896/Trade-credit-The-growing-role-of-trade-credit-insurance-in-the-Middle-East. (Subscription required). Coface warns that the global recovery will be laborious and subject to multiple risks. Coface's recent Country Risk Conference, 'Global Economy Trends in One Day', has advised that the global economy is on the path of gradual recovery. with 3.1% growth predicted in 2015 - after 2.8% and and 2.7% growth in 2014 and 2013 respectively. Slight improvements are expected both in advanced countries (from 1.7% in 2014 to 2.1% in 2015) and in emerging countries (from 4.2% in 2014 to 4.3% in 2015). In the eurozone, growth should reach 1.2% in 2015 (after 0.8% in 2014 and 0.4% in 2013), while in the US strong growth of 2.9% in 2015 is based on on robust domestic demand and an industrial renaissance. To view Coface's news release go to http://www.coface.com/News-Publications/News/2015-Country-Risk-Conference-In-2015-the-global-recovery-will-be-laborious-and-subject-to-multiple-risks. Note: Video clips of presentations made during Coface's Country Risk Conference are available to view at http://www.coface.com/News-Publications/Coface-Country-Risk-Conference. Euler Hermes predicts a rise in insolvencies in China and Hong Kong. An article in GTR (Global Trade Review) has reported that, according to a new report by Euler Hermes, insolvencies are to increase in China, Hong Kong and Taiwan this year, with traders facing greater challenges than ever in accessing finance. Euler Hermes has warned that it expects the number of Chinese companies filing for bankruptcy to increase by 5% in 2015, with a similar rise predicted in Hong Kong. Euler Hermes' senior economist for Asia, Mahamoud Islam, told GTR: “The credit conditions are already tight, especially for any projects financed by non-bank institutions. The regulatory bias is likely to be towards tightening further to contain financing risk” . To view the article on GTR's website go to http://www.gtreview.com/trade-finance/global-trade-review-news/2015/January/China-insolvencies-to-hit-commodities_12184.shtml. Coface reports that economic activity is gaining strength in Middle East and North Africa region. Coface's latest Panorama report on the MEMA region advises that after a period of political and social turmoil, economic activity is gaining strength in the Middle East and North Africa region. Although growth performance will continue to stand below the 2000-2010 average of 5.4%, Coface predicts that growth of 2.6% in 2014 will accelerate to 3.2% in 2015 influenced by economic recovery and preliminary signs of political consensus in some countries of the region. In addition, on the back of robust non-hydrocarbon activities and large budget surpluses, the GCC countries are expected to have grown by 4.2% in 2014 followed by 4.1% growth in 2015. There are exceptions however; in some countries - such as Iraq and Libya - regional turmoil will weigh heavily on their economic performance. To view Coface's news release go to http://www.coface.com/News-Publications/News/Middle-East-and-North-Africa-region-What-progress-after-the-Arab-Spring. A link to the full Panorama is given. Euler Hermes expert suggests that the construction industry's New Year’s resolution should be to maintain a diligent approach to credit and working capital management. Kalpana Padhiar, risk underwriting manager and construction specialist at Euler Hermes, has published an article in Construction News which cautions that although conditions appear to have improved for the construction industry, with a stream of new contracts coming to the market, fundamental risks still remain within the sector. Kalpana warns that contractors could find it difficult to find the materials and human capital to take on new projects as quickly and as effectively as they would like, and - for an industry already running on tight margins- any late payments or penalties from delays on contracts could prove disastrous. "While pursuing growth and capitalising on new contract opportunities will be important, management teams must proceed with caution. Therefore a steady and sustainable growth strategy is paramount." To view the full article on Construction News' website go to http://www.cnplus.co.uk/sme-hub/running-an-sme/new-dynamic-for-construction-smes-in-2015/8674726.article#.VNIRov7kfYg. Note: Construction News is a subscriber publication, but its comment and guest registration (for limited access) is free. AIG research finds that many companies are unaware of the concept of single multinational insurance programmes. An article by AIG, 'Building multinational programme awareness: a work in progress', has reported that a key finding of research recently commissioned by AIG, and carried out by DVL Smith, has found that companies growing their overseas businesses are walking a tightrope between expansion and exposure - often without an adequate awareness of the options available to protect their business, such a multinational credit insurance programmes across different market practices in different territories. In some cases this is due to the relatively low prioritisation of insurance, but in others because of poor awareness. "A staggering 70% of the 3,000 or so participants in the International Trade Survey 2014 were unaware of the concept of a multinational insurance programme that covers an organisation wherever it operates in the world." The research found that even larger turnover respondents were relatively uninformed. To view AIG's article go to http://www.aig.co.uk/chartis/internet/uk/eni/AIG_%20ITS_Article_5-Multinational_Programmes-FINAL_tcm2538-659541.pdf. Poland's construction sector: Coface asks if its turbulent times are over. Coface has reported that insolvency statistics for the Polish construction sector show that a milestone has been reached; it has transformed from a negative performer to the sector with one of the highest improvements in terms of insolvencies. For example, the first three quarters of 2014 saw a 26% decrease in insolvencies. However Grzegorz Sielewicz, Coface Economist Central Europe Region, cautioned: “Whereas the outlook for the construction sector is relatively positive, it should be noted that many entities are still suffering from a long period of deterioration and liquidity problems. They welcome the signs of recovery as a relief, but long-term improvement is necessary to be referred in their financial situation”. To view Coface's news release go to http://www.coface.com/News-Publications/News/Poland-s-construction-sector-are-turbulent-times-over. A link to the full report is given. Arthur J. Gallagher makes US acquisition. Arthur J. Gallagher & Co has announced the acquisition of Aequus Trade Credit LLC in Warren, New Jersey. Established in 1997, Aequus Trade Credit (Aequus) is a specialist insurance broker that offers credit risk mitigation products and services. They focus primarily on credit and political risk insurance and accounts receivable puts for middle-market and Fortune 1000 clients throughout the US. Marc Wagman and his associates will continue to operate under the direction of Douglas Brown, head of Gallagher's Northeastern region retail property/casualty brokerage operation. "The Aequus team is well known for their industry experience and solid market relationships," said J. Patrick Gallagher, Jr. Chairman, President and CEO. "Their expertise will be a wonderful complement to our Trade Credit and Political Risk practice group." To View Arthur J. Gallagher's news release go to http://investor.ajg.com/phoenix.zhtml?c=104111&p=irol-newsArticle&ID=2012640. Euler Hermes opens a new office in Bulgaria. Euler Hermes has opened a new office in Sofia, Bulgaria, to provide trade credit insurance services to Bulgarian clients. The office will also contribute local business intelligence and underwriting skills to the Group’s international network. Ludovic Senecaut, CEO of Euler Hermes Northern Europe Region commented: “The new office in Bulgaria represents an important strategic step for Euler Hermes in the Northern Europe Region. We believe Bulgaria offers many business opportunities that will strengthen our position and growth in the coming years.” Euler Hermes also forecasts a continued positive short-term evolution of the Bulgarian economy with real GDP growth in Bulgaria of +2% in 2015, followed by +2.5% in 2016. To view Euler Hermes' news release go to http://www.eulerhermes.com/mediacenter/news/Pages/press-release-Sofia-Bulgaria-office.aspx. Nexus CIFS advises that City Link's demise makes the case for credit insurance all the more compelling. Following the recent demise of City Link, Nexus CIFS' Neil Payton has published an article on CIFS' website considering if, following five years of losses, a low margin operation and in a market characterised by overcapacity, this was a "car crash waiting to happen. Although, with the benefit of hindsight, this may be the case, he stresses that City Link seemed set to benefit from significant investment from turnaround specialist Better Capital, as well as ongoing expansion in Internet trading (and a concomitant growth in home deliveries), as well as lower fuel prices. As a result, Better Capital's unexpected decision to pull the plug on City Link came as a surprise but, as Neil points out, indicates a new climate where private equity investors are taking a more hard-headed approach. City Link's example, he advises, "makes the case for credit insurance all the more compelling." To view CIFS' article go to http://www.creditindemnity.com/news-and-comment/detail/city-link-the-shape-of-things-to-come. Atradius advises that the launch of ASEAN Economic Community (AEC) by the end of 2015 will have far-reaching economic consequences. Atradius' latest Country Report on South East Asia advises that plans to launch the so-called ASEAN Economic Community (AEC) by the end of 2015 are expected to have far-reaching economic consequences, by significantly promoting intra- and extra- ASEAN trade and investment and by strengthening the global importance of the ASEAN as an economic bloc. Atradius advises that the combined economies of the 10 ASEAN members are expected to grow by 5.1% in 2015, following growth of 4.6% in 2014. Major contributors to the anticipated GDP growth in 2015 are expected to be a rise in private consumption (up 4.8% in 2015 from 4.3% in 2014) and export growth (up 5.7% in 2015 after 3.8% growth in 2014). To view the report on Atradius' website go to http://global.atradius.com/images/stories/CountryReports/Southeast_Asia_Feb_2015.pdf. Coface advises that depreciation in exchange rates and sluggish domestic demand has affected the payment performance of Turkish companies. Coface's latest Panorama on Turkey reports that the Turkish economy grew by 3.1% in 2014 and forecasts improved growth of 3.5% in 2015. However, Coface also notes that slowing domestic demand due to rises in interest rates and the sharp depreciation in exchange rates at the beginning of 2014 reflected negatively on the payment performance and profitability of companies. Bad checks amounted to 15.9 billion TL in the first 10 months of 2014, up by 5.4%, while the amount of protested bills also rose by 9.1% year-on-year in the first ten months of 2014. To view Coface's news release go to http://www.coface.com/News-Publications/News/Turkey-Depreciation-in-exchange-rates-and-sluggish-domestic-demand-affect-corporate-payment-performance. A link to the Panorama is available from this webpage. Economic Research from Atradius. Atradius has published a series of brief Economic Research reports. To view the reports please go to http://global.atradius.com/. 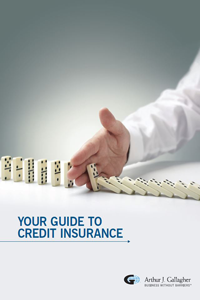 Arthur J. Gallagher’s Trade Credit Practice has published a whitepaper entitled 'Your Guide to Credit Insurance'. Aimed mainly at businesses unfamiliar with this class of insurance, this guide is designed to provide a thorough introduction into the product and the benefits of engaging a specialist broker. To obtain your copy please click here. The ICM British Credit Awards 2014, 11 February 2015 at The Brewery, London. ICM British Credit Awards, the recognised standard in the credit and collections industry, take place on 11 February 2015 at the Brewery in London. The Awards bring a focus to the credit industry with awards covering the different aspects of credit from consumer and commercial lending to credit insurance, use of technology and business information. To book your place at this most prestigious event or to find out more, visit www.ICMBritishCreditAwards.com. 11th Annual India Trade & Export Finance Conference, 12 February 2015. Mumbai, India. Mena Trade Finance Week 2015, 16-18 February. Dubai, UAE. Building on its strong presence in the Middle East for more than a decade, GTR’s flagship event for the region has now evolved into GTR Mena Trade Finance Week 2015. Now in its 12th year, the conference will welcome government heads and representatives from leading local and global businesses, as well as financial institutions, agencies and various other supporting sectors from across the trade finance community. A 15% discount is available for Credit Insurance News Digest readers, please quote CIN15. Click here for more information. 8th Annual Russia & CIS Trade & Export Finance Conference, 17 February 2015. Moscow, Russia. 25th Anniversary Insuring Export Credit & Political Risk, 24-25 February 2015. Millennium Hotel London Mayfair. View the latest agenda. Insuring Export Credit and Political Risk is the leading event for the global political risk & export credit industry, attracting 300+ attendees from 35+ countries year after year. This year’s 25th Anniversary Convention will see 70+ industry leading speakers and panellists providing unique insight via 21 sessions on everything from current market developments to the macroeconomic and geopolitical risk climate, including concurrent streams on Insurance, Finance & Regulation and Managing Emerging Markets Risk. Other 25th Anniversary highlights include a Keynote Panel on the Russia-Ukraine Crisis, featuring a panel of former UK Ambassadors, and a Keynote Address on ISIS & Middle East Security from the BBC. 10% Discount available with VIP Code FKW52849CRN– Register here. 2nd Annual Australia Trade & Supply Chain Finance Conference, 2 - 4 March. Sydney, Australia. Following 2014’s successful inaugural event, the conference will welcome Australia’s most influential leaders from across the trade finance industry to explore how best to increase the country’s export volumes. Discussions will also focus on developing and implementing successful supply chain finance structures. A 15% discount is available for Credit Insurance News Digest readers, please quote CIN15. Click here for more information. 15th Annual Global Receivables, Factoring & Supply Chain Finance Convention, 25-26 March 2015. Madrid. The current receivables finance market is one of rapid development and change with new players, new product mixes and emerging secondary markets. Banks, factors and supply chain financiers that have flexible structural mechanisms and are able to respond quickly to new ideas, breakthroughs and newer demands, are more successful in competitive environments. In addition, the agile receivables finance player must be able to nimbly adjust to take advantage of emerging opportunities using strategic policy-making, intervention and market-friendly instruments. ‘RFIx Madrid 2015’ looks at how banks and independent factors, supply chain finance companies and other receivables financiers are responding to this challenge and what more they can do to successfully compete in an increasingly charged, expanding and integrated environment. Please contact: Malou Lindholm, Head of Events, BCR Publishing for more information E: ml@bcrpub.com - T: +44 (0)20 8466 6987 or go to http://www.rfixmadrid.com/. The Credit Summit 2015, 26 March 2015. QEII Conference Centre, London. The Credit Summit returns on 26 March 2015 to the QEII Conference Centre with more networking, more sessions, more delegates, more speakers and even more conference streams. We’re expanding - now with a total of 10 conferences, significant new audiences will be welcomed into the largest daytime credit industry event. With so many elements to the show the summit can be tailored to specific roles and sectors which means there is something at the event for everyone. For more information and to register visit www.creditsummit.co.uk, call 020 7940 4835 or email events@credittoday.co.uk. The Credit Today Awards 2015, 14 May 2015. Grosvenor House, London. It is time to put forward your entries for the most prestigious credit industry awards scheme. Whether you work within the sphere of trade credit, or your organisation offers credit to businesses or consumers, there will be at least one category for you! So if you are looking for a promotion and want to demonstrate your achievements to senior management, your firm has made significant strides in the treatment of customers or your team has surpassed all expectations and deserve a public pat on the back, enter the Credit Today Awards, sponsored by Qualco. The event returns for its 16th year on 14 May 2015 and there is no hall of fame better to join than the most recognised and established industry awards. Our winners go on to reach even better heights once they take home a trophy. Make sure it’s you in 2015. View the categories and submit your entries by 6 February by visiting www.credittodayawards.co.uk. For more information call 020 7940 4835 or email events@credittoday.co.uk. Coface Country Risk Conference 2015. 4 June, London. Gathering economists, industry experts, companies and their business partners, this conference aims to help businesses trade safely by providing key information involved in making domestic and export trading decisions. This year’s event will be in London on the morning of Thursday 4th June, followed by a buffet lunch. To register your interest in attending please email crc_uk@coface.com. As the International Credit Insurance & Surety Association (ICISA) strongly endorses the STECIS training seminar programme, ICISA member companies receive a 5% discount on the total seminar fee. Companies (ICISA members and non-ICISA members) registering three or more participants to one training seminar, receive a 10% discount on the total seminar fee. For more information, please visit the website www.stecis.org or contact STECIS by sending an e-mail to info@stecis.org or call+31 20 528 5170. And Finally: A very special offer for readers . . .
We are delighted to bring you an exclusive and very generous offer to see the Olivier Award winning adaptation of E. Nesbit’s classic novel The Railway Children at London's Kings Cross Theatre. Set in a new, purpose built 1,000 seat venue complete with state of the art heating system, this breath-taking show features a stage built around a real train track, and a beautiful 60-tonne locomotive that steams into the theatre to delight all ages. This is a truly unique theatrical experience. You may even catch my daughter performing on some evenings! Top price tickets £49.50 reduced to £35 valid until 22nd May, Tue – Fri performances (Excluding 7th – 22nd Feb and 23rd Match – 19th April and Sat and Sun performances). Click here to book and quote KXOFFER. Alternatively book by phone on 0844 871 7604. Broker Support For a Specialist Trade Credit Insurance Broker. A full time position for a broker support role to assist two experienced Specialist Trade Credit insurance Brokers in securing policy renewals and new business. Salary £22,000 per annum, possible £2,000 bonus and 22 days holiday. We’re a thriving, friendly brokerage based in Hastingwood. Our business is growing rapidly and we are now looking for an experienced, professional person who can provide high level support with confidence to two experienced Specialist Trade Credit Insurance Brokers. The role involves supporting the two directors when they are out of the office or simply not available by dealing with telephone and email enquiries or tasks set. We are committed in making a real difference to our market and we have invested in the industry’s first dedicated policy compliance software which has assisted us along with exceptional client service in becoming one of the fastest growing Trade Credit Insurance broker in the UK. Our ability to offer local broker service in 70 offices in 38 countries (sole UK member of the ICBA) has enabled us to secure multinational clients. The successful candidate must have the skill and personality to build relationships over a period of time with clients and underwriters. This is a fantastic opportunity to build a career with a great brand. In the first instance please send your CV and a covering email explaining why you are interested in this role and what you can bring to it to amoylan@efcis.com. (Please mention Credit Insurance News Digest when applying). The Role: To Process claims received (assessment or settlement) and allocation of recoveries. May also manage a portfolio of claims. * Enter and process claims received via fax, mail or Eolis. * Review and analyze content of the claim for validity and coverage analysis to determine/assess liability to the company. Candidates should have a very good knowledge of policies, and a good knowledge of contract law and local insolvency procedures. They should also be comfortable with numbers and have good analytical skills with attention to detail. Experience of decision making with good interpersonal skills. Click here for more information and to apply. (Please mention Credit Insurance News Digest. Strategic Account Manager - Euler Hermes. Canary Wharf. London. The Role: To renew a portfolio of policies against an agreed set of targets and in accordance with the Company's business plan. To maintain and develop relationships with clients which maximise retention and the selling of all appropriate Euler products and services. To maximise new business opportunities from your existing portfolio. * Negotiate and secure renewal of a portfolio of policies in accordance with company strategy. * Manage and develop relationships with clients which enable growth of your portfolio. * Maximise the selling of all appropriate Euler products and services. * Provide an appropriate Account Management service plan to include regular meetings with presentations of the Euler offering. * Develop close relationships with brokers to ensure their support. Candidates should have expert know-how in specifics of market and an ability to build extensive network with close contacts to brokers, market players and opinion leaders. They should also have an ability to communicate and negotiate effectively with board level personnel, both internally and externally, together with an ability to liaise and build relationships with members of other core functions and sell the benefits of Euler over the competition. Click here for more information and to apply. (Please mentionCredit Insurance News Digest). Risk Underwriter - Euler Hermes, Canary Wharf London. The role: To ensure effective credit limit service in terms of decision quality, turnaround time and communication toward customers. Business Development Manager / Trade Credit Insurance. AU Group - Dubai, UAE. (Ref: OP502-02). The Role: Developing a portfolio of clients and achieving new business target in Trade Credit Insurance. Key responsibilities include: Calling prospects from the CRM Database to establish levels of interest in Trade Credit Insurance and schedule meetings. Generating and converting leads. Meeting managers and educating businesses about Trade Credit Insurance. Negotiating with top management and decision makers, CFO or GM. Closing deals at the end of the sales cycle. Applicants should be fluent in English and Arabic (French is optional, be energetic and tenacious (with charm), have a positive attitude with a high desire to succeed and the ability to work autonomously. A bachelor or Master degree is also required, together with experience in insurance or bank industry. Click here for more information and to apply. (Please mention Credit Insurance News Digest when applying). Commercial Underwriting Officer. Salary £35,000 - £50,000. One of the world's largest insurers is looking for a new Commercial Underwriting Officer to provide policy support to the underwriting manager. Specialising in corporate credit insurance, this exciting role will involve product development and policy wording for the large and international markets. Successful candidates should have: 3+ years' experience in credit insurance, underwriting expertise and a university degree (ideally Business, Finance, Insurance or Law). Product development and policy wording knowledge is also required. To apply, please contact Ben Wade (ben.wade@reedglobal.com) or call 0207 220 4777. (Please mention Credit Insurance News Digest when applying). Trade Credit Broking, Client Service Executive, Reading. Salary Dependent on Experience. We are seeking a Trade Credit Insurance Broker with a minimum 1 years’ experience for a client service role as an Account Handler (Client Service Executive) to support our Team in Reading. The successful individual will be assisting a small team of Account Executives (AE’s) and Account Directors (AD’s) in developing and servicing a varied client portfolio. The Willis Credit Risk team in Reading supports Willis’ UK Regional business and reports into the Willis Financial Solutions Division, the worlds’ largest combined global Political and Trade Credit broker, operating from London, New York, Singapore and 6 other cities. Key responsibilities will include all the usual service needs for mainstream trade credit insurance policies and new business broking as well as providing an element of administrative back up. To be considered you must have some relevant experience working either within Credit Insurance broking / Credit Risk underwriting or a related field. Your key skills will include: understanding of trade credit, credit management or trade finance, excellent communication skills and client relationship experience, with the ability to work independently as well as part of a team. Salary and terms are dependent on experience, with all the usual benefits of working for one of the world's largest insurance brokers. Contact Christine Pringle (pringlecs@willis.com) on +44 113 283 2913 for more information. (Please mention Credit Insurance News Digest when applying). Credit Analyst - UK Obligors - Great Development Potential (ref:26402966), London. £25,000 - £42,000 per annum, inc benefits. This client, a world leader in the credit guarantee arena is seeking a Credit Analyst or Credit Underwriter to join their team in Canary Wharf. This is a large department who have a great social ethic and work environment coupled with excellent opportunities for training and development. The role itself will see you carrying out analysis on UK Corporates by reviewing financial information (balance sheets, cashflows, P&L) and allocating a grading to these firms. You'll also be responsible for monitoring the credit-worthiness of a portfolio of companies who have already been graded. Its a challenging role which will require diligence and numeracy to be able to quickly and accurately identify any issues with the clients' financials and communicating these to interested parties. As you become accustomed to the role you'll also be responsible for meeting with the companies to discuss their financials, discuss the decision making with interested parties - justifying your decision making, and negotiating credit limits when required. Therefore you must be an excellent communicator both written and spoken. The client is considering applicants who come with existing credit analysis experience, ideally of UK corporates, and the ability to understand and interpret financial statements. This could be in the role of Credit Underwriter, Credit Analyst, Mortgage or Loan underwriter (business not residential), or similar role. Alternatively the client will consider graduates who have a numerate degree (economics, maths, etc) with some work experience (either paid work since University or internships) within a financial environment and some basic exposure to credit analysis. Get in touch: Kerren Leach | Senior Consultant | +44 207 092 3283 | kerren.leach@eamesconsulting.com. (Please mention Credit Insurance News Digest when applying). Field Based Credit Analyst (ref: 6440257), Leicestershire / Northants. To £40,000 plus car and package. This is a leader in the Credit Insurance Services market operating in 50 countries and part of a large Insurer company. They offer credit insurance services to enable customers to trade and build their business safely and responsibly. As part of the Birmingham regional risk office, this role will be based from home covering the East Midlands area. The role holder will own a portfolio of clients across the region and you will manage your own diary involving home working, client meetings and occasional work in the Birmingham office. The main purpose of this role will be to manage a portfolio of risks in order to mitigate and prevent claims. You will monitor companies, conduct financial analysis, lead high level meetings, produce reports and take action in order to minimise risk of loss. Applications are welcome from individuals from any credit analyst background which could include, insurance, banking or financial services. Proven experience in analysing financial and economic information relevant to assessing credit risk is essential, as well as substantial experience in interpreting balance sheets, P and L and other financial statements. The role will involve board level meetings and as such applicants must be able to hold high level meetings with credibility and gravitas. To apply, please contact Charlotte Webb Business Manager – General Insurance, Reed Insurance Tel: 0121 237 5550 or email Charlotte.Webb@reedglobal.com. Please mention Credit Insurance News Digest when applying). Trade Credit Underwriting, Regional Lead. Singapore. Salary Dependent on Experience. A global insurance group is looking for an experienced trade credit underwriter to lead their team of underwriters in the South-East Asia region. You will be responsible for managing client relationships at the C-Suite level and have experience interpreting and conveying detailed financial analysis, as well as mentoring more junior underwriters. Financial analysis experience in South East Asia is desirable as is experience managing a team. Contact: Guy.Turton@ipsgroupasia.com Ref: HH489115GT. (Please mention Credit Insurance News Digest when applying). Credit Analyst, Lloyds insurer - Political and Credit Risk Underwriting team.£70,000 (negotiable, dependent on experience), and bonus and benefits. Following continued growth, and significant capital injection, this Lloyds Insurer has identified the requirement for a permanent Credit Analyst to join their Political & Credit Risk Underwriting team. This is a fantastic opportunity to join the team in a growth phase which will see you establishing and growing the credit analysis function within the business. In addition you’ll gain exposure to a much wider array of transactions than you would within a traditional bank or ratings environment. Your key responsibility is to support the underwriters in making prudent and profitable underwriting decisions on a wide range of insurance policies. Typically these policies will be to support major banks’ and commodity trading houses’ transactions. The analysis required will include revolve around understanding the credit-worthiness of international obligors which could be public, private or financial institutions. Therefore you’ll need to review financials, country/sovereign risk, counterparty risk, deal structure, and various other categories on a worldwide basis. Although this role is within an insurer they are willing to consider candidates with financial / risk analytical skills specifically around company financials and complex financing structures from a banking environment or rating house an/or exposure to country / counterparty / sovereign risk analysis on financial transactions. The ability to read and understand foreign financials and excellent communication and relationship building skills is also required. Experience or understanding of credit / political risk insurance is desirable. ESSENTIAL: It is key that you have experience of analysing medium to long term transactions and overseas obligors; the client is specifically not seeking individuals who have solely been involved in the P&L/Balance Sheet analysis of UK Domiciled organisations for a traditional credit insurer If the above describes you and you’re looking for a challenging, but rewarding career within the Lloyds Insurance Market then please don’t hesitate to apply. Salary of around £70,000 (negotiable, dependant on experience), bonus and benefits on offer. Get in touch: Kerren Leach | Senior Consultant | +44 207 092 3283 | kerren.leach@eamesconsulting.com. (Please mention Credit Insurance News Digest when applying). Senior Underwriter, Trade Credit. Dubai. This global credit insurer is looking to add a Senior Underwriter into their Dubai based team. This comes as part of continued growth in the region and looking to further maximise broker relationships. The role itself will see you carrying out all of the duties of a Commercial Underwriter including broker management, quotation on new and renewal business, liaison with Risk Underwriting to gain limit approval, presentation to end clients as well as all other typical duties. The client base focused upon will be mid-large corporate. There is a real opportunity for you to make your mark on the business here and build a strong reputation not only within the local, but also the global trade credit market. This would best suit someone who is presently working within one of the more mature trade credit environments, such as UK, Australia or North America, and is interested in experiencing the Tax Free ex-pat lifestyle that Dubai offers. Due to the multicultural environment within Dubai, fluent spoken & written English is essential. Along with a competitive, tax free, basic salary (£55k - £70k, USD90k – USD 110k, AUD110k – AUD135k) you’ll receive a strong company benefits, annual bonus as well as full relocation package. If you’re an experienced Commercial Underwriter or Trade Credit Broker who is keen to try something new then please don’t hesitate to contact me for a confidential discussion. Kerren Leach / Senior Consultant / +44 207 092 3283 /kerren.leach@eamesconsulting.com. (Please mention Credit Insurance News Digest when applying). Partnership Expert - Account Manager. If you have a background in working with large financial institutions and selling products/partnership deals to the banking world then this might be a great opportunity for you. One of the UK's biggest trade credit insurers is looking for a talented financial sales individual to come on board as part of the global growth footprint. Your main role will be sourcing and targeting clients to set up partnerships for them to up-sale your products and name in the market place. With a market place competitive base and commission structure this is a great opportunity for someone looking for a new challenge. Contact ben.wade@reedglobal.com for more details. (Please mention Credit Insurance News Digest when applying). An opportunity has arisen within a global trade credit insurer within their London office. You will be responsible for being the linchpin between the external brokers and internal underwriting team with a focus on the global client base. This is a great role that will suit looking to expand there knowledge of the global market and work for one of the leading names. Paying a market place competitive salary, please contact ben.wade@reedglobal.com for more information. (Please mention Credit Insurance News Digest when applying). Coface has announced that Julien Marcilly has been appointed as its chief economist from 2 March 2015. He will report directly to Jean-Marc Pillu, CEO, and will succeed Yves Zlotowski, who who decided to give a new direction to his career in a field unrelated to economic research or credit insurance business. Mr Marcilly has a doctorate in economics from the University of Paris-Dauphine, a Masters in Management from ESCP Europe and a deep knowledge of emerging markets. QBE European Operations has appointed Tom Johnson as surety underwriter with QBE’s trade credit and surety department. He will report to Steve Manwaring, surety manager. Mr Johnson will be responsible for further developing QBE’s surety portfolio in the UK and Europe. He joins from Euler Hermes. Standard Chartered’s trade programmes and credit risk team has announced that Kirk Lee, previously divisional director, credit and political risks at Arthur J Gallagher,has joined its team. Mr Lee will remain in Singapore and will focus on the use of trade credit insurance by the bank to actively manage its portfolio exposures and balance sheet risks.